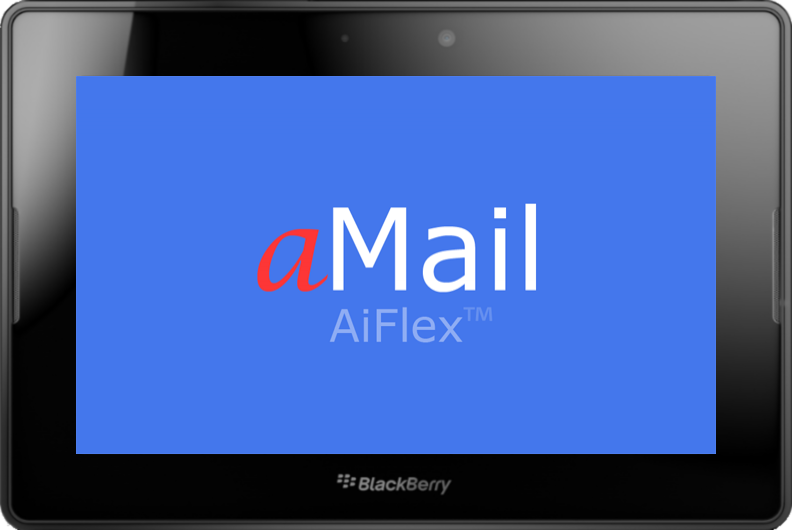 aMail by AiFlex for the BlackBerry® Playbook™ provides native email for multiple accounts in one easy to use App. This App supports IMAP, SMTP and POP3 accounts with secure logon and password details over a secure connection. With easy to setup GMail, Yahoo, Hotmail and Live e-mail preset configurations, which only require username and passwords to setup. It can easily be setup on other providers such as AOL etc. 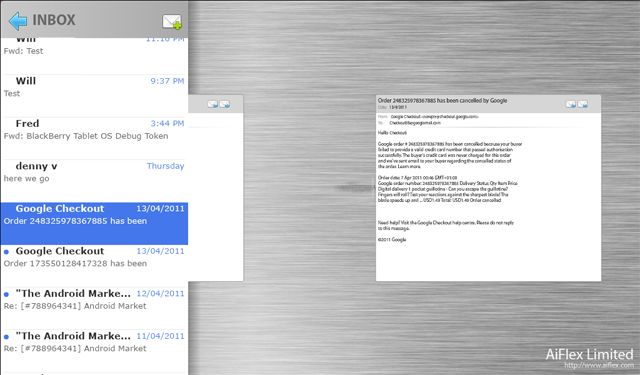 It is like having Outlook or Thunderbird on your Playbook™. Whenever you need to check your email accounts and send a quick email message, aMail makes it all possible. aMail provides an easy to use interface to manage your mail accounts. Set up an account in seconds with automatic configuration. This native app has advanced features to make best use of the interface to save you time. aMail uses TLS / SSL full authentication. 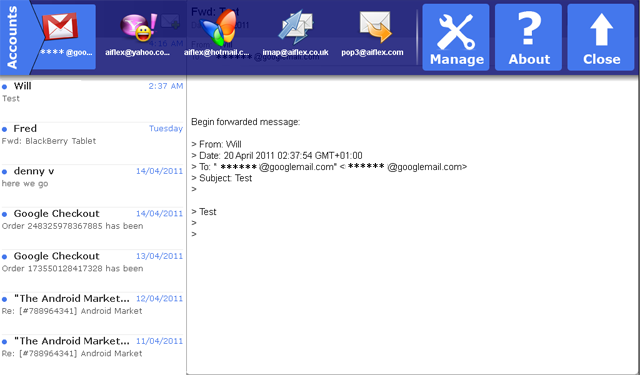 Swipe down for email accounts overview. 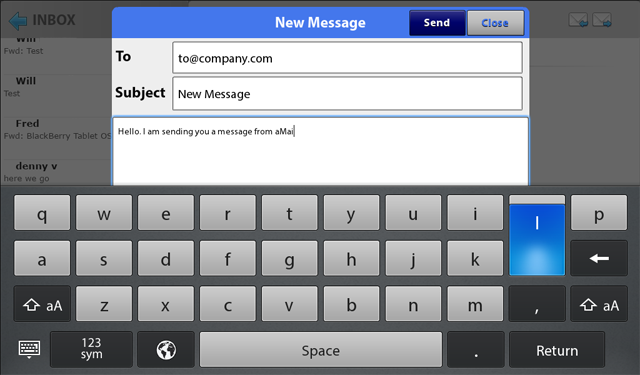 Use your on device soft keyboard, swiping up from the lower bezel edge for text input. Coming soon attachments, multitouch gestures. 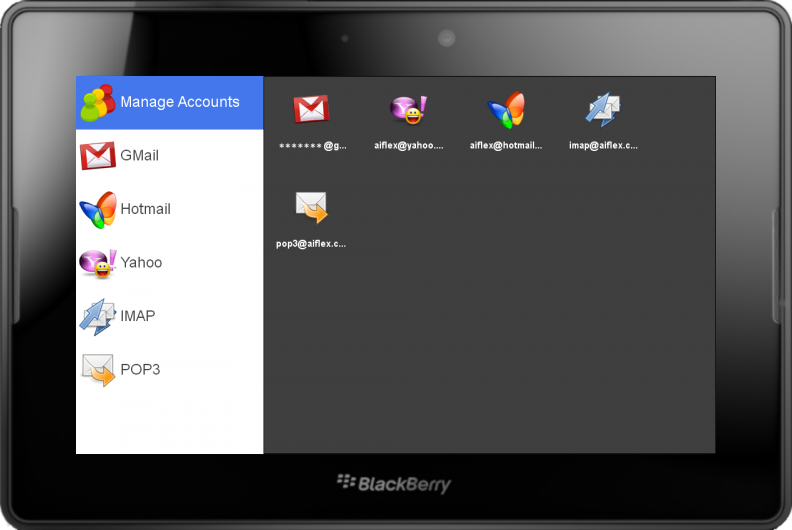 AiFlex is now providing Blackberry playbook application development. Get your app on the playbook today. Get a quote today from AiFlex for a dynamic cost effective solution. AiFlex has produced a range of solutions for many different market sectors. If you have a need we tailor the solution to meet your exact requirements. We use a range of technologies to create a whole solution, using technologies from web based to desktop to mobile. This allows us to provide premium solutions. "AiFlex provided a complete easy to use solution for our web needs and it has improved our web usage stats by 10,000 users per month"